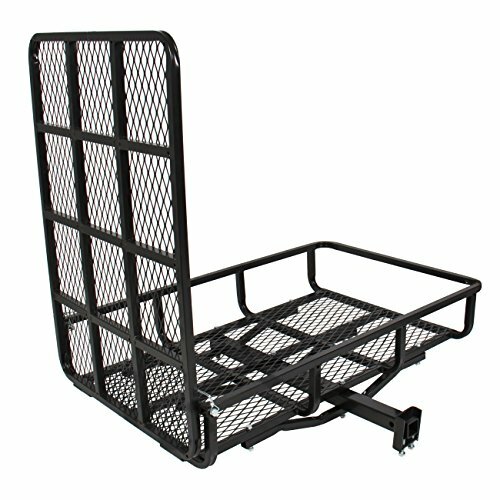 Hitch carrier racks provide a safe and secure way to transport wheelchairs, power scooters, lawn mowers, snow blowers, and other heavy wheeled items. 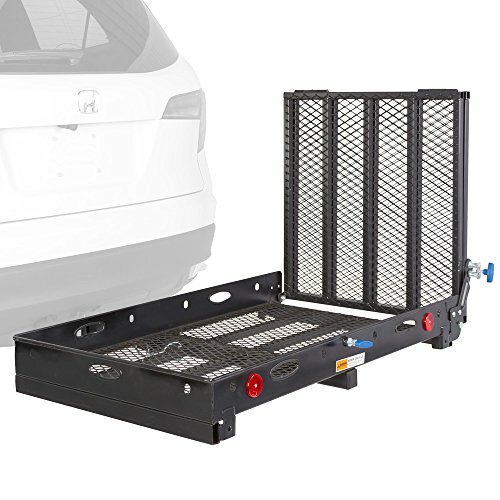 They also include integrated ramps- making it easy to roll your cargo into the hitch carrier and secure it for transport. The 68., lb TMS folding hitch carrier is our top pick- it is an all-in-one platform and ramp with a 400 lb. weight capacity and is hitch class III or IV. One user describes loading her 700 lb. Rascal power scooter on this mobility transport rack- saying that it fit seamlessly on her pickup truck, enabling her to travel to local supermarkets with ease. Set up required only about 20 minutes and mostly entailed tightening up some of the nuts and bolts of the hitch carrier. One user did describe replacing some of the bolts used on the carrier's hitch sleeve to make it even more secure to keep it from excessive jolting during transport. There have been some isolated complaints of shipping damage and rusting- though proper maintenance will help prevent rusting. Do some research prior to purchase to make sure that the hitch carrier will work for your particular vehicle. Let's take a look at five of the best-selling mobility scooter carriers on the market today and see how they compare. The Silver Spring Hitch Carrier, with an easy to use integrated 59″L x 27.5″W (26.5″ usable width) loading ramp and 4.25″ tall raised side rails, is a good option that features an easy 5 bolt assembly, and an anti-tilt locking device to reduce carrier wobble. Its users like that its ramp folds out to the ground and has a decent reach when you cannot get close to the curb. However, they also note that rusting may be an issue. It can transport most power wheelchairs and scooters using a vehicle’s 2″ Class III or IV trailer hitch (11-18″ hitch height). It has a durable, long-lasting heavy duty black steel construction that can hold up to 500 lb. This product has received mixed reviews, with some users recommending it as a good alternative for the more expensive options in the market, while at the same time disliking how it can be rattly and can rust easily. A user said that assembly of this product requires two people and can be a struggle to get on straight. The aluminum-constructed, 500 lb capacity Economy Hitch Mounted Carrier is a good option that is built to last. Its users like that it is lightweight, but also note that driving at higher speeds may cause the load to move dangerously. The dimensions of its usable platform area are 47″L x 27-3/4″W. It has a safe 7-1/2″ high side rail and built-in tie down anchor points for straps. It fits 2″ Class III or IV trailer hitch receivers, and with its 45-3/8″L x 27-3/4″W integrated loading ramp, can support many power scooter models. The loading ramp folds upright after the scooter is loaded. The hitch receiver tube allows for 8-1/4″ clearance from hitch pin hole to the carrier frame. 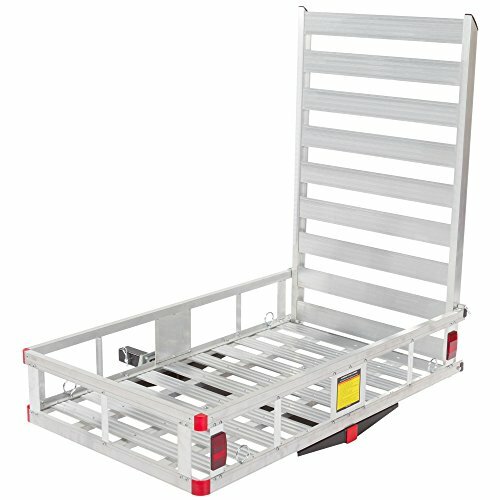 This scooter carrier rack is a nice option if you are looking for a lightweight hitch carrier. Users of this hitch mounted scooter carrier like that it is relatively easy to put together. Those who installed this product find it a great way to haul an electric mobility scooter and at the same time enjoy its affordability. However, one user feels that the scooter he loaded onto it moved more than what he considered safe for travelling at decent speeds. The 75 lb, 47” x 31” Best Choice Products SKY1700 Mobility Wheelchair Carrier is a solid option that can be positioned 3 different ways (closed flat, open L-shape & open flat). Its users like that it is very easy to put together, but also note that some of the holes need to be filed to open them up more. It has a heavy-duty steel construction with pull locks, 2″ hitch receiver for hitch class III or IV, and a 3” safety rail. It is finished with a durable black powder coating. This mobility hitch carrier is a good option if you are looking for a sturdy scooter rack hitch carrier. Overall, users are happy with the durability and price point of this hitch carrier. They like that the platform feels very solid and stable. However, one user noted that it is fine for a low car, but on a higher vehicle it is too high and the ramp is at such an angle that it’s very difficult to load the scooter up the ramp. A number of users also complained that the unit didn’t fold flat as described, and that the holes do not line up properly. The 71 lb, 48” x 28” TMS ® Folding Strong Electric Wheelchair Hitch Carrier is a decent option that has a folding ramp that is easily locked upright with double heavy duty internal spring loaded pull locks. Its users love that it is extremely easy to install, but also note that rusting may occur more easily than hoped. Its heavy duty steel construction has a carrying capacity of 400 lbs. It is finished with a black powder coat. It fits 2” receivers of hitch class III or IV. At only 16 lbs, the folding ramp is easy to lift. It can also be locked flat when not in use. Tie down straps can be hooked onto any of the tie down holes featured on the ramp sides. This electric wheelchair/mobility scooter carrier is a good option if you are looking for a rigid and strong hitch carrier. The general consensus on the TMS ® hitch carrier is that it is solidly built, with some users saying that it can carry more than the indicated 400 lb capacity. However, a few users did say that some sagging was observed. Users also like that it is rigid, allowing stability even in dirt roads with speed bumps or through high speed expressways. 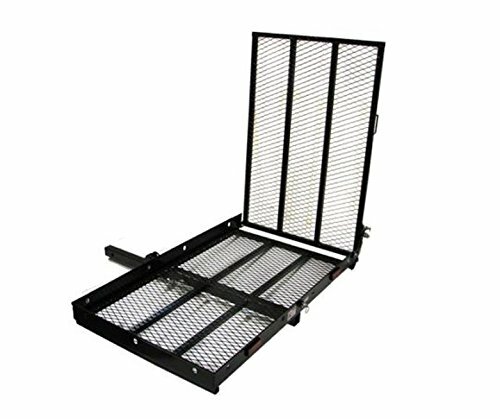 The 44” x 29”, 500 lb capacity Direct Aftermarket Electric Wheelchair Hitch Carrier is a good option that has an epoxy powder coated tubular steel frame construction. Its users enjoy its easy assembly, but also note that the metal feels a bit flimsy. It is hitch mounted to a class III or IV trailer hitch and requires a 2” square hole. For additional protection and ample tie down spots, the carriage is built with a 7” high railing. It has a 42” ramp for loading and unloading. This is a viable option if you are looking for hitch carrier with ramp that can easily fit the budget. Most of the users of this hitch carrier are satisfied with their purchase. They like that it is easy to put together and that it is convenient to use. Many of the users agree that they got a good quality product for the price. However, some users think that the metal tubing used for the construction are too small gauged. In addition, users who owned high vehicles observed that the ramp is too short to be useful. But overall, its price point and durability are what make this product attractive to would-be buyers. If you or a loved one use a mobility scooter, wheelchair, you are doubtlessly familiar with the difficulty of transporting these heavy, but indispensable, medical equipment. Perhaps you are traveling to visit family, and you can't be without your mobility scooter, or you might just want to pop down to the local supermarket or Walmart to do some shopping- a hitch carrier can securely attached to your vehicle and help you to transport your mobility device wherever you need to bring it. These hitch carriers also double as ramps, so you can just unfold it, wheel the mobility aid onto the platform, secure it, and you are good to go. When not in use, they will actually collapse so that they are flat-pressed against the back of your vehicle- this is a great way to minimize the space the wheelchair hitch carrier takes up when not in service. Some users don't employ these hitch carriers for wheelchairs or power scooters- instead they use them to transport heavy-duty lawn care equipment or cargo like snowblowers- this enables them to transport these unwieldy, expensive tools to different job sites. It's important to note that your hauling capacity may vary by the type of vehicle you own- with large pickup trucks, obviously, having stronger capacities to carry weighty cargo than smaller coupes, for example. Another important consideration, is that some cars and trucks will necessitate installation of heavier springs or air shocks to bolster the suspension and ensure that the vehicle doesn't sag under the hitch carrier cargo weight. Ongoing maintenance is also recommended to ensure that all of the nuts and bolts remain secure, that rusting doesn't compromise the strength of your hitch carrier, and that the unit consistently remained secure during transport with minimal wobbling or jolting. Indeed, we have seen many incapacitated and handicapped individuals regain quality-of-life by purchasing a wheelchair hitch carrier- it lets them go to many areas they couldn't access before, with much greater ease. As well, many workmen are fans of these cargo hitch carriers because it lets them transport their heavy-duty equipment to different job sites, simply rolling their commercial lawnmowers or snowblowers up onto the rack and driving off wherever they need to go. 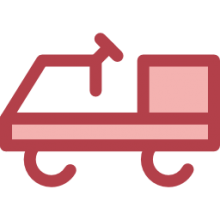 If you are in the market for a hitch carrier rack for power chairs, wheelchairs or large, heavy-duty tools, check out our reviews on this page, and examine the comparison table to get a sense of what's available on the market today.